In this new story over at the Detroit Free Press which the Drudge Report had linked to Sunday morning, they report that fresh off of making a campaign video that helped get Alexandria Ocasio-Cortez elected, a young Detroit couple has launched a pro-socialism media company out of their house which, for a $10 a month subscription, will offer viewers 'pro-worker' and 'anti-capitalist' programming, including original TV shows, comedy and on the ground reporting. 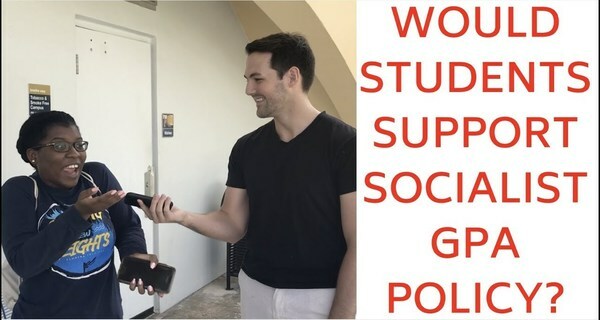 Just the latest evidence of America's younger generations turning towards socialism with many 'millennials' and members of 'Generation Z' feeling dissatisfied with where they see society headed, we also see 'seeds of awakening' within their story with both members of the couple brought up in Democrat-voting households who now realize they've long been lied to. “I grew up with this idea that Democrats were morally right. And after 2016, I realized that they’re all full of (expletive) — it’s not true. After eight years of Obama, nothing happened, except things got worse," Naomi Burton said. Yet while they see a potential 'answer' in socialism, and we certainly understand their frustration when they say "Our future is almost guaranteed to be worse than the future of our parents (at our age), which is essentially the case now", history has proven that socialism IS NOT the answer to their's and the world's misery and in fact, such a system will only bring more. And while we completely understand and feel empathy when we hear "When I talk to young people, especially those who have come from poverty, there is no hope for a better future" and "They know that the whole ‘I’m going to maybe be rich someday’ is a trap", the REAL trap is allowing America to fall into socialism and everything that historically comes with it. And in this March 29th story over at Campus Reform, we see perfectly illustrated a huge reason why socialism is sure to fail in America should it ever be implemented here; while more young people than ever before say they prefer socialism over capitalism, the Campus Reform story shows that those same young people who want socialism don't want to have to pay for it. 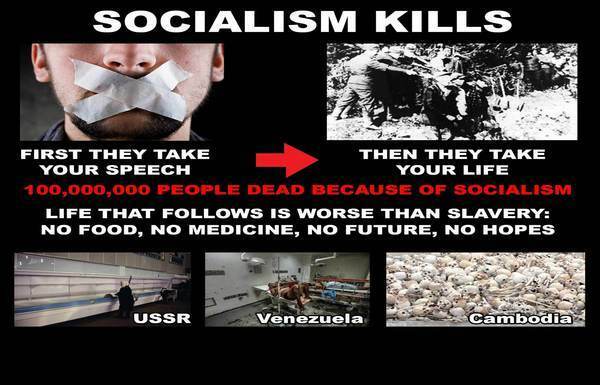 With America slowly creeping towards totalitarianism over the last several years, and with censorship a huge part of that 'creep', the image above speaks louder than words, with millions of people victims of socialism through the years. Any system that forces people to participate in it is clearly a totalitarian system and while the younger generations of the left dive into socialism blindly, a quick look at what happened to Venezuela over the past several years should offer proof it's not the answer. And as we've seen now throughout the European Union, socialism in EU countries has brought very real tyranny with people there now unable to even criticize the totalitarian political philosophy of Islam without being arrested or punished. As the Foundation for Economic Education had reported back in 2016, socialism in Venezuela had led to the deaths of more babies there than in war-torn Syria and as their story reported, "sadly, and unsurprising, the results of socialist economics are predictable". There are a lot of arguments about whether communism, socialism, and liberalism are the same thing. 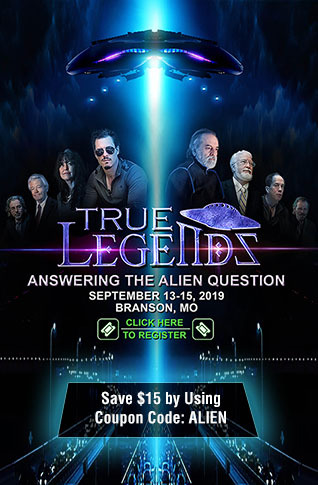 What shouldn't be arguable is that they're all closely related branches of the same tree. If you don't want to live in a house made out of Aleppo Pine, you probably won't like a Coulter Pine or Eastern White Pine house either. Since socialism has failed so often, socialists of every stripe bend over backwards to disassociate themselves from the many other disasters created by their ideology. Still, a pine by any other name is still a pine. Socialism is particularly dangerous because it's so perfectly suited for the modern era. It's the ultimate "miracle" product: it's "nice," it's "fair," it'll make you feel good about yourself, it'll "help" people who "deserve it" by taking things away from people who "have so much" they'll barely miss it. It sounds wonderful, doesn't it? But, like most products with sleazy salesmen and hidden track records, the promises socialism makes are all a mirage. Since our schools do a terrible job of teaching history and economics these days, it's our job to explain how socialism slowly, insidiously eats away at the core of a society. 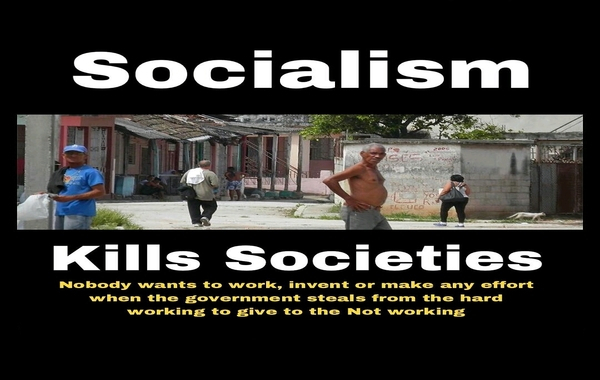 That story then went on to outline for us the 5 ways that socialism destroys societies. 1) It kills economic growth: Strong economic growth is what produces jobs, tax revenue and a better standard of living for everyone, including the poor and middle class. That's what John F. Kennedy was driving at when he said, "A rising tide (in the economy) lifts all boats." Socialism strangles economic growth in the crib by penalizing success and rewarding failure. When you loot the successful people in a society to give it to the less successful, you quite naturally reduce the number of successful people and encourage more people to fail. This leads to a never-ending cycle. 2) It stifles free speech: Why is there ridiculous government propaganda in nations like North Korea? Why are most schools, papers, and colleges run by liberals in the United States? Why do liberals often try to disrupt conservative speakers on college campuses? Why are there such extreme speech codes in Canada that it practically makes some conservative arguments illegal? Why does speaking out against the government risk imprisonment in China and the old Soviet Union? Because socialism requires protection, propaganda, intimidation, and darkness to survive. Socialism can't survive honest, informed debate about its merits among people who are free to choose or reject it because it would not survive the conversation. (ANP: Sound familiar to what we're listening from the left today?) As Reagan said, "How do you tell a communist? Well, it's someone who reads Marx and Lenin. And how do you tell an anti-Communist? It's someone who understands Marx and Lenin." 3) It leads to an increasingly tyrannical government: Freedom and socialism go together like oil and water. The more socialism you have, the less freedom you will have because socialism can't survive if people are free to choose whether they want socialism or not. People who are free to say what they want will criticize socialism's many failures. Areas that aren't tightly controlled will move towards the free exchange of ideas and goods, not socialism. So, socialism requires a massive bureaucracy that almost inevitably grows. As government grows, it inevitably becomes more centralized, more distant from the people and ultimately more menacing. 4) It creates strife and division: Socialism is all about turning people against each other. (ANP: Once more, exactly what we're seeing from Democrats in 2019.) It has to be. After all, if you believe in controlling people's lives, the people who don't wish to be controlled need to be vilified. If you believe in confiscating the wealth of successful people who won't give it up willingly, then others must be convinced they're terrible human beings who deserve to be punished. "Victim" classes must be created for the socialists to defend because if everyone is responsible for himself, what need is there for the socialist? Eventually, those who depend on government for their livelihood and those that the government smears and loots to pay them off come to hate each other. 5) Socialists believe the ends justify the means: Like the pigs in Orwell's Animal Farm, socialists believe that, "All animals are equal, but some animals are more equal than others." For a socialist, the overriding concern is always promoting socialism; so process, rules and regulation mean different things for different people. Fidel Castro may have been the leader of a Communist revolution against the evil "rich people" in Cuba, but he was worth 900 million dollars. 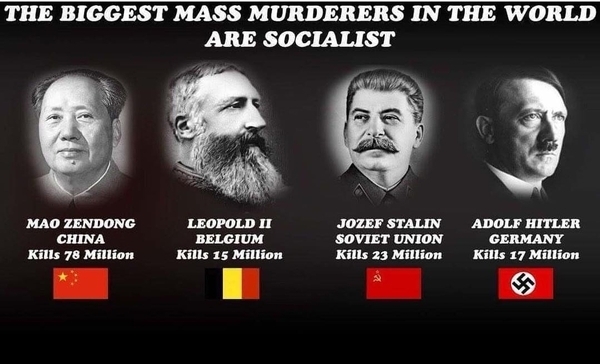 With the biggest mass murderers in world history also socialists and socialism proven to be a tool of dictatorial states which then ban with the threat of death all debate, functioning in darkness as the leaders of the nations get even more rich while the people of socialist nations fall into the pits of despair, Americans should fight tooth and nail to make sure socialism never fully arrives on our shores. As Susan Duclos had reported on ANP back on March 19th, those who've lived in socialist regimes are horrified that America's younger generation actually believes such a system could be the answer to their's and the world's problems and with many of the current Democratic presidential candidates embracing socialist positions such as 'medicare for all', so-called 'reparations' for black Americans (what about reparations to the millions of American Indians families SLAUGHTERED by the US government?) and 'climate change', there's little doubt that the 2020 election will determine America's future. With Democrats also now calling for a counter-insurgency against whiteness as they move ever more towards the fully radical left and prove how much they hate America, knowing the ways that socialism kills societies, it's never been more important for America's older generations to attempt to teach the younger generations what comes along with socialism for if America's future makes the mistake to fully jump into socialism in the years ahead, the fully corrupted government that America already had created under Barack Obama and the globalists is fully prepared to run its course, likely turning America into the kind of bottomless death traps we've already seen in China, the Soviet Union and elsewhere through history.